Here’s a rocking one for you. Here is a new one from a new artist to us here at CML. Kate Russell put out a new album late in 2016. The title track, Give Your Love To Me, looks like it’s still getting some good attention even from a few radio stations. But there was one song that stood out on Spotify. So we’re going to look at that one. But be sure to check out all the songs. 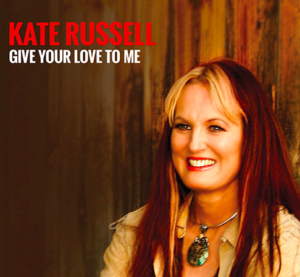 And if you’re a Kate Russell fan (it looks like she has quite a few) be sure to leave a comment showing your support. You can definitely hear the rock influences in this one. It kind of reminds me of something that Heart might have done early in their career. And I’m a big fan of Heart’s music. It’s pretty awesome when a woman rocks out and has a good time. Even with all that rock influence, though, I still think it fits in with country music really well. The two genres have always had their similarities at certain times. Wynonna certainly knew how to throw down with a rocking country song. And Carrie Underwood has done more than a few rocking covers in concert and has put out some rocking singles including her last one, Dirty Laundry. So it’s obvious that many country fans have a love for rocking country. That’s probably why Kate already has so many fans in her corner. I’m sure they’ve been playing this full album and rocking out to this one. I was going to start naming my favorite songs from the album, then I realized I was listing every song! They are all incredible. Make sure you check out each and every one.